Having done the Tea Plantation tour in Sri Lanka, it seemed only fair to do one of the Coffee Tours in Boquete Panama – And very informative it was. 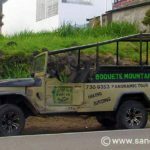 We booked our tour at the Boquete Mountain Safari tours office for $29 per person. 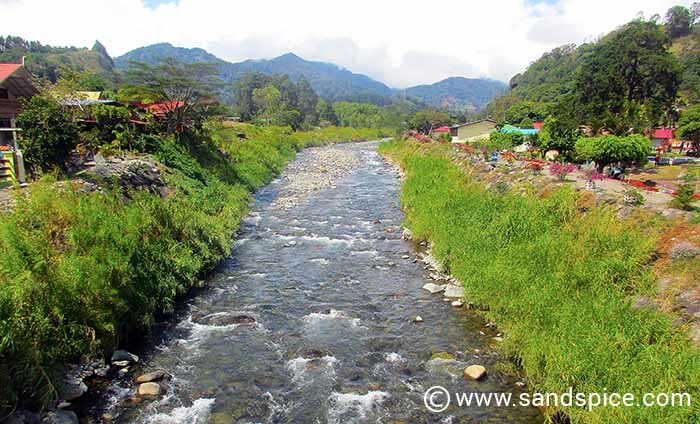 In fact, for the same price they offered to let us join a group for their combined Coffee Tour plus Panoramic Jeep Safari (normally $49 per person). We started from their office early in the morning with the Panoramic Jeep Safari. We were driven all around the highlands surrounding the central Boquete valley. Needless to say the elevated views were impressive. 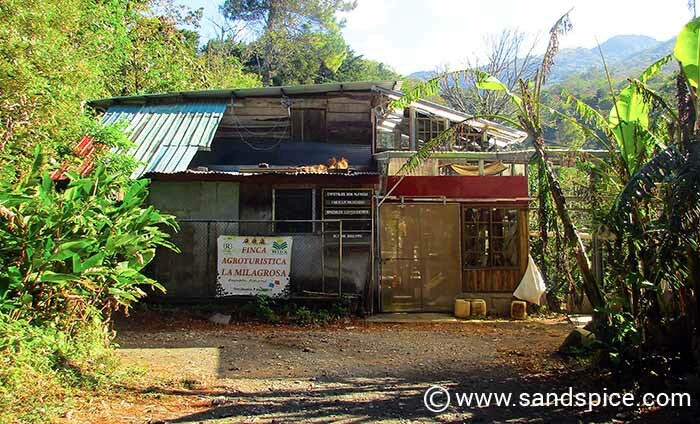 After our tour of the valley, we were taken to Finca Agroturistica La Milagrosa – a small coffee plantation owned by the extremely innovative Tito Vargas. He started his business in the early 1980’s when he acquired 5 hectares of land located 1500 meters above sea level in Alto Jaramillo. This is where he began to plant his coffee trees. It takes around 10 years to harvest a good coffee tree. The beans are handpicked every day during the season, after which each tree is cut down to ¼ of its size to permit new growth and harvest for the following year. The farm uses organic fertilizer made from coffee skin and coffee shells. Tito built by hand his production plant building, and used his garage to assemble his first tools and machines from scratch. Many of the coffee-processing machines still used today were hand-built by Tito using parts from his Jeep and an old washing machine that he took apart for pieces. Our tour guide Jorge explained the different varieties of coffee that are produced at the plantation, and guided us through the whole coffee process, from harvest to cup. When the coffee beans are harvested, they go through a process where the red skin is separated from the beans. Once the skin is removed, the beans are sorted by size and then spend 20 to 30 hours fermenting. After fermentation, the coffee beans are washed. They are left to dry in the sun for 15 days, and are then sent to a dry storage area for a further 3 months until fully dried. 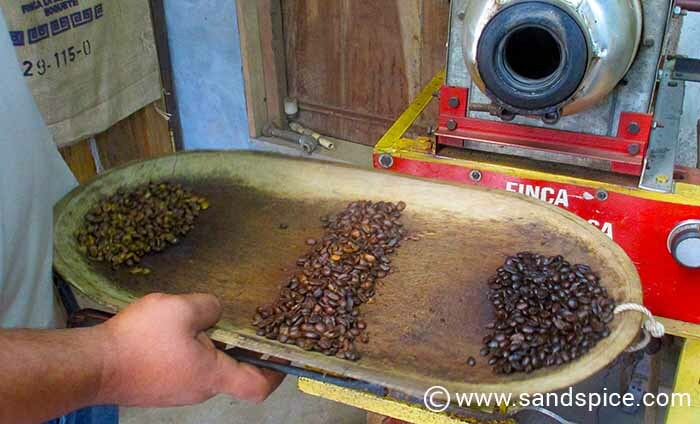 Once the beans are dried, they are selected by size: the bigger, the better. The whole process takes 9 months, and the final product is green coffee. The coffee beans are exported green – without roasting – because roasting standards vary from country to country. The next step in our tour was the tasting, but first the coffee beans needed to be roasted. The handmade roasting machine (once a stovetop oven) was warmed up to around 200-300°, and then Jorge started roasting the beans. ♦ American: (light color). Lighter in color because the beans are less exposed to the heat. This method preserves a high caffeine content. ♦ French (medium color). The French roasting style is a bit darker, balanced between the American and Italian preparations. ♦ Italian (dark color). A darker coffee with less caffeine. I was also disillusioned of the notion that there is more caffeine in a coffee that is darker, thicker and more bitter. In fact, the Italian-style espresso has very little caffeine compared to the American style coffee. 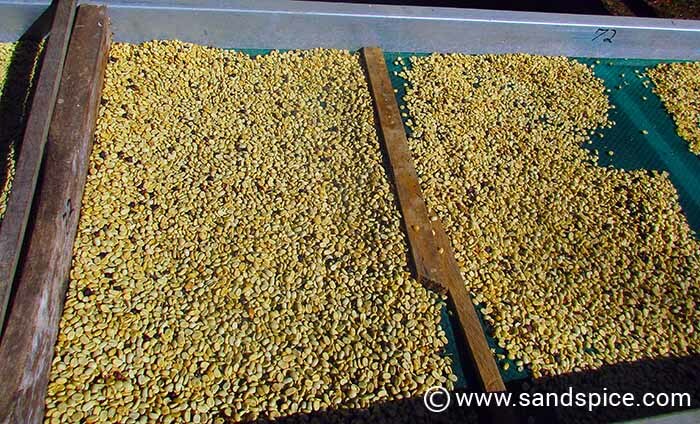 Once the beans were roasted, they were allowed to cool down before grinding and removal of the dry shell. Finally, we were rewarded with a small cup of freshly-ground coffee – the American preparation. Our tour around the coffee plantation took around 1½ hours in total. Decaffeinated coffee is produced by boiling the green beans. The caffeine that is extracted is sold to the soft drink and energy drink companies. 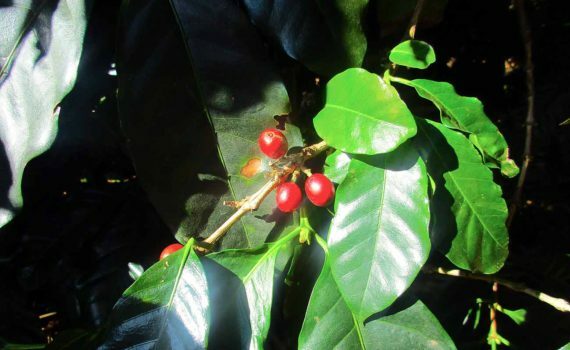 Coffee Tours in Boquete Panama – What’s in a Name? The name of the farm La Milagrosa, means miraculous, since Tito was able to fulfill his dream with no resources whatsoever. 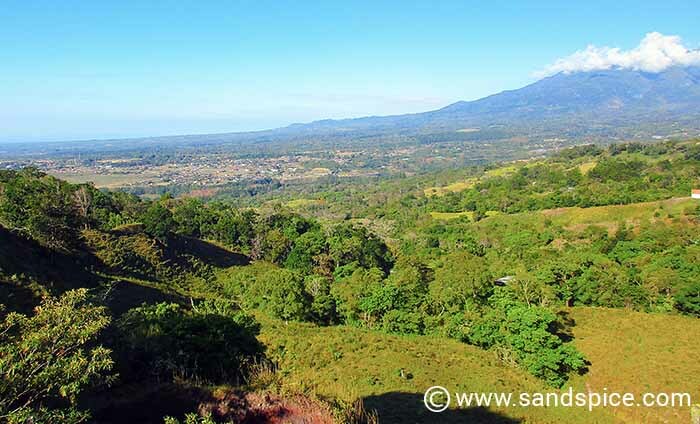 It also refers to the transformation that the land underwent from a milk producing cattle farm to a coffee plantation. Today both of his brands: Royal and Cafetales Don Alfredo are named in honor of his parents. The name Royal is simply the result of a mix of both of his parents names “Rosa y Alfredo”. Finca la Milagrosa is ranked the 2nd best in all coffee in Panama, producing exclusively Arabic coffee. They produce between 20,000 to 25,000 pounds of coffee per year, exporting to Japan, Taiwan, the USA, Norway & Canada. The farm produces 8 varieties of Arabic coffee with its most famous – the Geisha – valued at around US$100 per pound. Geisha coffee is not very dark, resembling a tea color with aromas of jasmine and citrus. The name Geisha has no relation with Japan, but originates from a small Ethiopian valley named Gesha, from where the coffee originally came. When in Panama, it is best to buy your coffee from a coffee plantation since the best quality coffee is exported and not available for retail in Panama.